Q: A common equipment solution across all the Services is often sought but that’s not always possible. How do you balance a joint solution with Service specific needs in the area of hearing protection? A: Hearing Conservation policies begin with a Department of Defense (DoD) instruction that describes the overall hearing conservation programme. Each Service then writes Service- specific regulations that detail how that programme will be accomplished, the responsibilities and any unique Service issues. Hearing protection is one part of a hearing conservation programme. The DoD has an “approved list” of hearing protection. The list of approved hearing protection is all inclusive but Service-specific differences are allowed. For example, the Air Force does not allow the use of banded hearing protection. Requirements for improved hearing protection are developed through the acquisition system. The Army and Marines are more exposed to impulse noise and they have focused their attention on solutions like Nacre’s intelligent hearing protection systems. The Navy and Air Force have more very loud continuous noise exposure such as from aircraft engines and have recently emphasised very deep insertion, custom hearing protection to protect from very loud, continuous noise exposure. Small arms and larger ordnance damage the ear very differently from other kinds of in-garrison or on board ship exposures. Continuous noise exposure causes long term cellular change, resulting in significant hearing loss in the longer term. Small arms and heavy ordnance noise, results in physical, mechanical damage to the structures of the unprotected ear. Because the damage is very different, the protection is somewhat different too. The good news is that studies show that almost any kind of hearing protection will protect you from impulse noise from small arms. A well-fitted ear plug can protect your hearing but that creates other problems. Conventional earplugs or earmuffs compromise situational awareness when you need to be able to hear the things that are going on around you. You need more that just hearing protection, you need the ability to hear and localize sounds. On a firing range, situational awareness and hearing warnings and communication are also vital but “Sound management earmuffs” with built-in amplification that shuts off with hazard noise levels can meet that need. 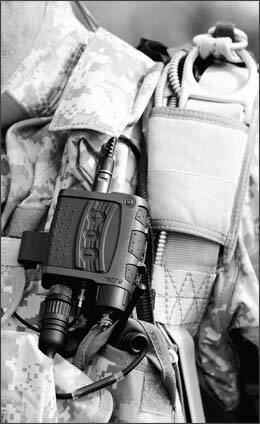 In a combat environment, the need for capability with other equipment (helmets), the need to communicate via radio and voice while being protected from impulse noise is critical. That’s where Nacre’s advanced, intelligent hearing protection, QUIETPRO® meets the need. Q: How is Nacre’s product line moving forward? A: Nacre has made continuous improvement to their products to make their QUIETPRO® product line more ruggedised and appropriate for the deployed environment. The changes do not always necessarily lie in technical or hardware improvements but in their field use. Nacre emphasises the need for training to use this sort of high tech solution. Some users without appropriate training have rejected the technology. Folks don’t use it because they don’t know what to expect from it. They don’t trust it, they haven’t trained with it, and they don’t know which eartip size to use, how to ensure a good seal or what position to put it in and in what kind of environment. They say that the system isn’t really protecting them because when they put it in, they can still hear everything that is going on around them so they don’t know if it’s protecting their ears so they don’t wear it at all. Nacre personnel have been working with units so that they will know what to expect and how to use the solution properly. The need for training is not limited to technical solutions such as the QUIETPRO®. Users need training for every type of hearing protection to ensure proper fit and use. There is anecdotal information that when troops do get training, they use QUIETPRO® to enhance their survivability and lethality. Users need to appreciate the value of hearing on the battlefield and for life in general. Leaders and soldiers need to see this as one of their tools to be able to do their mission better. The US Army has led the way in treating hearing as a readiness issue. Army units have to check off that personnel have had their dental work, eye tests, etc. Now a hearing test and their hearing protection is included in that readiness assessment. The Marines are also well on their way to including hearing in a commander’s readiness report. I think it is critical to make the commander responsible for this because it is a tool that they can use to complete their mission and to keep their soldiers, sailors, marines and airmen safe. Q: How is the regulatory environment for hearing protection changing? A: One of the jokes I often tell is that there are two things you don’t want to see being made – sausages and regulations. We have known for many decades that excessive noise causes hearing loss. We continue to learn details about how noise induced hearing loss occurs and how impulse noise affects the ear. When it gets into the regulatory realm, compromises are often made between the science and physics of sound and the requirements of productivity and mission accomplishment. For example, while most countries use 85dB permissible exposure level (PEL) and a 3dB exchange rate based on the physics of sound, in the US, we use a 90dB PEL and a 5dB exchange rate. Even within the DoD, there was a compromise made such that the Army and Air Force adopted the 3-dB exchange rate, the Navy adopted a 4-dB exchange rate. I understand there is now movement toward the international standard of 3-dB for all Services. Q: How do other aspects of a soldier’s protective suite of equipment affect hearing? A: Helmets can affect localisation; where did that blast come from, my left or right, front or back? There was a recent study in which localization tests were undertaken using various helmets; one had the ear completely open (the helmet curved around the ear), another where the ear was partially covered and the third when it was totally covered. In a very controlled environment, sound localisation discrimination was tested using those helmets as well as hearing protection. The study found that the more you protect the ear, both with helmet and with earplugs, the poorer localisation you have. You have to come up with a compromise between protection and still being able to do your mission. That is where intelligent hearing protection can help a lot because you can amplify sound and still be protected. In-ear advanced communication systems (Nacre QUIETPRO®) cause less degradation in localization than conventional or level-dependent HPDs. Compared to the unoccluded (no earplug), bare headed condition, subjects had most difficulty distinguishing 30 degree differences just in front of or behind the interaural axis. The interaural axis is a line going through each ear. The authors conclude that it’s unlikely that this degree of resolution is required in field operations. With Nacre QUIETPRO®, hemifield discrimination (was the sound left or right including close to midline?) was relatively good and that is the critical discrimination in combat environments. Q: The question of increased risk of infections associated with in-ear often comes up. Is this borne out by the evidence? A: Worldwide as children, our mothers tell us not to stick in anything smaller than our elbow in our ear. With earplugs, we must overcome that training! Population studies comparing groups of people who use earplugs routinely and those who never use earplugs show no greater prevalence of ear infection so use of earplugs doesn’t increase the risk of ear infection. If a person has an active outer-ear infection, they would not want to use earplugs until the ear is healed and they will probably have to wear something different (earmuffs) until they resolve that temporary issue but hearing protection in and of itself generally doesn’t cause infections. One concern is that if the ear plugs feel uncomfortable they must be leading to ear infection. One way to prevent discomfort in the ear is to use the right size ear plug. Q: Providing a laboratory and factory test to prove that a headset is working is one thing, how do you ensure that the systems will be fitted properly to ensure that dB reduction is realised in the field. How do people know its working? A: The first key is to get a good fit, an air-tight seal. The Nacre intelligent hearing system actually comes with several different sizes of foam ear tips. All earplugs need to achieve this seal in order to reduce the noise. An exciting trend in hearing conservation right now is that there are several products on the market that actually allow you fit test a hearing protector - both foam and multi-use rubber earplug -you fit it in your ear and then be able to do a quick test and see if that plug is actually stopping sound. The first job of hearing protection including intelligent hearing protection is to block hazardous noise. Amplification can be an added feature as it is with the Nacre QUIETPRO®. The fit test can teach someone whether they have a good fit or not. I recently did a short study with some construction workers. They fitted their own conventional earplug a couple of times and we shared the results of the fit-test. Those results – the amount of noise reduction or attenuation that the earplug provided as fit in their ear – provide quantitative feedback about the fit of the earplug. These construction workers refitted and retested their earplugs a couple of times until they were ready to make their own estimate of how much noise was being blocked. Their estimates were in 5-dB categories, such as 5-10 dB, 10-15 dB etc. through 25-30 dB and more than 30 dB. On the last fit-test, they made an estimate before I showed them the results. They were within about 7.5dB (within two categories) for the vast majority of fits. I tested 17 people or 34 ears and in only four ears were they off by more than 2 categories. With that sort of individual fit testing it is quite easy to train people to know whether they have a good fit or not. The good thing about the Nacre system is that it has a built in fit check that gives the user immediate feedback on whether or not they have a proper seal for hearing protection and effective communication. In its training sessions, Nacre focuses on sizing and fitting of the earplug so that it becomes second nature to the user. It is critical that the people know whether they have a seal or not. It all comes back to training.